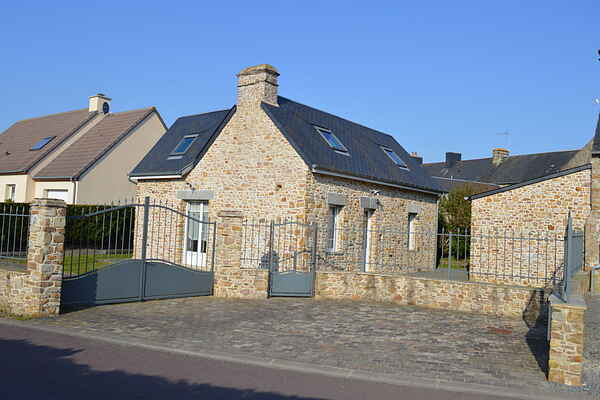 This charming half-timbered house (ideally situated between famed Mont-Saint-Michel, Cherbourg and the D-Day beaches) was fully renovated and converted into an extremely well cared for holiday home in 2015. Everything is new, from the kitchen to the bathrooms and the furniture, which adds to the cosy ambience. The upstairs consists of a walk-through bedroom that mainly serves a children's room. The second room is surprisingly spacious and equipped with a very high-quality double bed. A sliding door provides access to the back garden, where you will find a small grassy field and a concrete barbecue grill. The back garden is well protected, making it an enjoyable place to sit out for a long time on sunny days, and might be a convenient spot to safely store your bikes. You can park your car in the private parking area at the front. Creances is a charming French town on the west coast of the Cotentin Peninsula, with a selection of little restaurants and boutiques. Everything is within walking distance from the accommodation. Come enjoy the walking trails along the sea or the fine sandy beach which stretches for over 30 km! The D-Day beaches, Mont Saint Michel and the historic town of Cherbourg are also great daytrip destinations. Bienvenue in diverse Normandy!